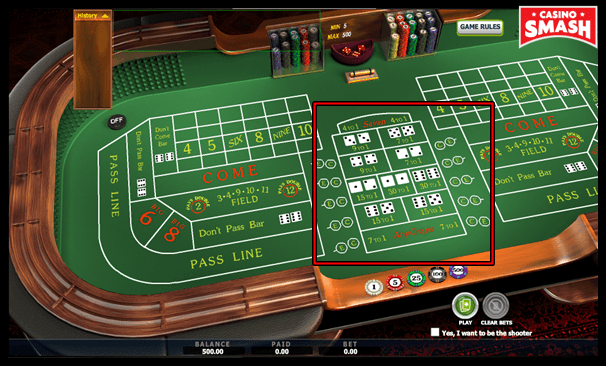 If you want to experience online or offline casinos to the fullest, you need to play craps. And this craps for dummies guide is here to teach you how. Craps is one of the most fascinating games you can play at casinos. But one glimpse at the craps table and the new players get intimidated. If that’s how you feel too – don’t. 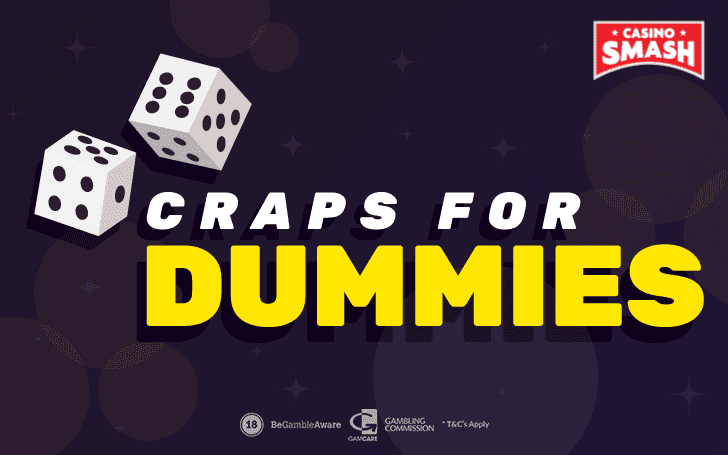 This craps for dummies guide will teach you how to play craps online. The game is really not that difficult. You may have seen gamblers playing craps. You may know you need two dice to play it. All you need to know now is a couple of terms, the basic rules, and a few betting rules. From the betting side, you could go a long way with one rule. But knowing more guarantees more fun, more excitement, and, naturally, more money. And that’s what you aim for, right? After learning how to play craps for dummies, you’ll regret you haven’t found this guide earlier. So, let’s not waste any more time and get to the point. Spoiler: after learning craps rules for dummies, you’ll know the previous sentence was a pun. But let’s not get ahead of ourselves. First things first. Before starting to learn the rules of craps for dummies, you need to know the terms that players and dealers use in the game. The act of rolling the dice is called shooting. Thus, respectively the player is called the shooter. During any bet of the game, you place bets on or against the shooter. In land-based casinos, many players can play craps at the same time, and you can bet on each of them. Online you bet on the virtual dealer rolling the dice. In some casinos, you’re the virtual shooter. So, you bet on yourself. Or against yourself. Yep, even betting against yourself is possible. You wouldn’t do that in real life. But when playing craps online it can bring you a fortune. The very first roll the shooter makes in the game is called the come-out roll. Also, any other roll in the game is a come-out roll if the shooter hasn’t rolled the point yet. And what is the point, you may ask? If the shooter rolls a 4, 5, 6, 8, 9, or 10, that number is the point. Here it is, the point. Now you can go on making your own puns. The dealer (or computer software) marks the point on the table with a small, usually white button that says ‘On’. And the shooter’s goal now is to roll it again. It doesn’t have to be the same combination. If the point was a 6 out of the dice showing up a 3 and another 3, to make 6 again the shooter can roll 1 and 5, 2 and 4, or 3 and 3. All combinations work. As long as the shooter rolls the point again before a 7, it’s good. What’s wrong with the 7? Let’s see. Rolling a 7 is not bad in itself. If the shooter does it on the come-out roll, s/he wins. A 7 is their friend. But if s/he rolls it when the point is established and before the point is rolled out again, the shooter sevens out. It’s a loss. And a 7 becomes their enemy. The same goes for an 11. You can call each of these numbers a natural. Craps is more than the name of this game. If the shooter rolls a 2, 3, or 12, we call the roll craps. And then the shooter loses. Of course, friend/enemy win/loss situation is relative even when you’re the shooter. The actual winnings depend on your betting. But let's talk about that a bit later. Once the terms are clear, you can move on to the rules. There are only three rules in craps. Or more precisely, three results of the come-out rolls. Learning them takes only a minute. If you know the terms, that is. Which you do now, right? Point 4, 5, 6, 8, 9, or 10 The dealer marks the point on the table, the shooter gets to roll again. If the point is rolled again before a 7 is, the shooter wins. If a 7 is rolled before, the shooter loses, and the round is over. The names of craps rules for dummies (or any craps rules) are equal to the terms describing the sums the shooter rolls. Thus, once you know the terms, it’s easy to remember them. But not everything is so easy. You wouldn’t need this guide on how to play craps for dummies if it was. Looking at the craps table layout can tell you what isn’t easy. The betting rules. If you play craps because you like rolling the dice, then craps rules for dummies is all you need to know. 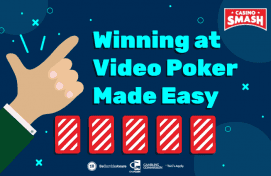 But if you want to win virtual chips or real money, you need to know the betting rules. That’s where it gets confusing and craps for dummies guide becomes a necessity. Do you want an easy game but still to keep the possibility to win? Then the Pass Line Bet is enough to learn right now. If you bet on the Pass Line, it means you bet that the shooter is going to win. You can make this bet only before the point is determined. Thus, the shooter winning can come in the form of rolling a natural or winning the point before rolling a 7. There’s an opposite bet, too. Accordingly named the Don’t Pass Line Bet. If you bet on the Don’t Pass Line, you hope for the shooter to roll a 2 or 3, or to roll a 7 before the point. If you have been reading carefully, you may have noticed that 12 is missing. While it makes the shooter lose, for the bettor on the Don’t Pass Line, it’s a push – no winning and no loss. These are the simplest and the best bets – the house edge on the Pass Line is only 1,41%. If you play other casino games, such as blackjack or roulette, you realize it’s a pretty decent one. Thus, you can learn Pass Line Bet and ignore all the other bets. But if you want to learn more and increase your winnings, keep on reading. Knowing the Pass Line Bet, this one comes easily. No pun intended. The Come Bet is the same as the Pass Line Bet. BUT you can make it only after the shooter establishes the point. Thus, you win with a 7 or an 11 rolled, lose with a 2, 3, or 12. The Come Bet can have its own point which the shooter can establish and roll within the same betting round. You bet on the Pass Line. The shooter rolls a 6. A 6 becomes the point of the betting round. When it’s marked on the table, you can make the Come Bet. The next roll brings a 9. The original betting round continues, so does the Come Bet. But the Come Bet now has an additional point – 9. If a 6 rolls before a 7, you win the Pass Line Bet. The betting round is over but the Come Bet is not. It continues until the shooter rolls a 9 or 7. A 9 would bring you a win while a 7 - a loss. Though, if a 7 rolls even before a 6, you lose both bets. The Don’t Come Bet works the same, but the other way round. You lose if the shooter rolls a 7 or 11, you win ifs a 2 or 3 is rolled, a 12 is a push just like in the Don’t Pass Line Bet. Once you know the point, you don’t want it rolling out before a 7 does. The Pass Line/Don’t Pass Line and the Come/Don’t Come bets last until they play out themselves. But you can also make one-roll bets. These work only for one roll, but you can make them any time during the game. There is one more proposition bet that usually lasts longer than one roll. 5 and 5 (common payout online 7:1). All the above-mentioned bets are more than enough to know for a beginner. Sometimes they are also enough for an advanced player to bet on. But this craps for dummies guide wouldn’t be complete without explaining a couple more of bets. The Field Bet is also a one-roll bet. The place to make your Field Bets is under the Come Bet zone. You win this bet if the shooter rolls a 2, 3, 4, 9, 10, 11, or 12. When playing craps online, a 2 usually pays 2:1, a 12 – 3:1, while other Field Bet outcomes pay 1:1. Once craps round has a point, you can make Place (aka Buy) Bets. For example, if the point is 6, you can bet on a 4, 5, 6, 8, 9, and 10. You win if your number rolls out before a 7 does. Like with many other bets in craps, you can also predict and bet on the opposite outcome. These bets are called the Lay Bets. Once the shooter establishes the point, you can bet against it or any other number in the Place Bets zone. You win if a 7 rolls out before that number does. The Place Bets zone is on the top part of the craps table online. If you place your chips above the number, you bet that it won’t roll before a 7. If you place below the number – you bet that it will. The Big 6 and the Big 8 are the least popular bets because the payout is always 1:1. Thus, you won’t find it on many online craps tables. But when you do, you can see it in the bottom corner of the table. The Big 6 and 8 bets are simple. When you place your chips there, you hope to see a 6 or 8 rolled before a 7 is. 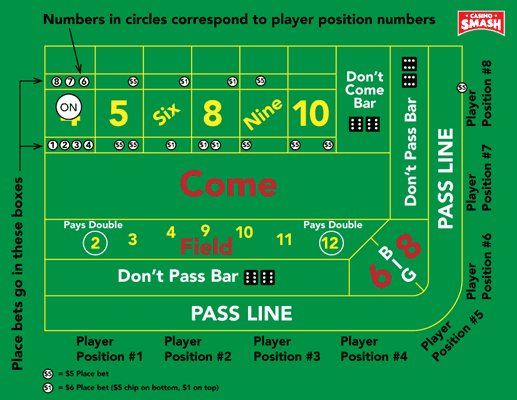 These are all craps rules for dummies you need to know to start playing craps online. It might seem like a lot, but it’s not. Read them once again carefully. Then open an account at King Billy casino and practice for free. That’s the best online casino to play craps for beginners. Once you feel you've mastered the game, play craps online for real money. The odds are good, the house edge is small, and the game is fun, so why not? Especially when King Billy gives you a generous bonus to start playing - 100% bonus up to €200 and 200 free spins! Plus, you'll get a bonus for the next three deposits. In total it can be a bonus of up to €1000! If you find a better offer online, please, let me know. Enjoy the bonus and playing craps at King Billy Casino!